Mynard, J. (2010). Editorial. Studies in Self-Access Learning Journal, 1(2), 68-71. Welcome to the second issue of SiSAL Journal. The journal was launched in June 2010 and the first issue featured a range of articles from colleagues based in Japan. In my first editorial, I mentioned that we hoped that future issues would have more of an international flavour and we are delighted to be able to feature articles from colleagues from the UK, Estonia, Uzbekistan, the USA and also Japan in the current issue. 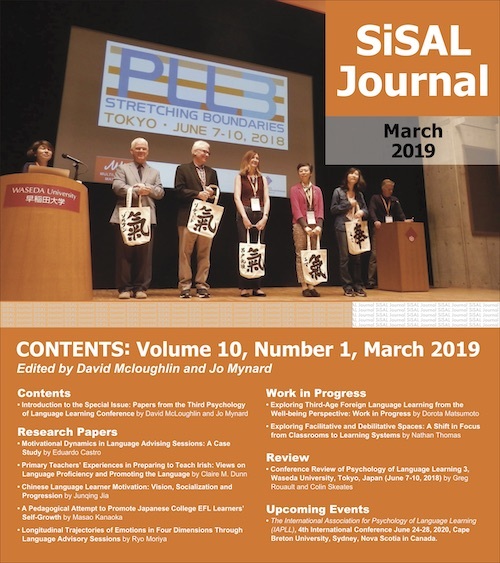 The first issues of SiSAL Journal will contain articles connected by a broad self-access theme. The intentions behind this idea are to highlight the various facets of the field and to feature related articles together as a mini collection. The theme of this second issue is “materials and activities” which, of course, is a key component of good self-access learning. It is appropriate that the first article is by Brian Tomlinson as he is well known for his work on materials development. In his article, Brian sets out some principles and procedures of self-access materials development. Brian proposes that 3 sets of principles (universal principles, delivery specific principles, and local principles) should be established before the materials development process even begins. This article is not only a good place to start when beginning a new materials development project, but could also be used to evaluate existing resources in a self-access centre. In the second article, Lucy Cooker and Richard Pemberton describe a materials project in the UK which introduces ESOL learners to resources in the community through the provision of activities designed to be used when visiting museums. Lucy and Richard share results of a small survey designed to investigate users’ perceptions of the materials and conclude by suggesting other locations within the community that could be used as learning environments. We are delighted to be able to reprint a recent article by Benjamin McMurry, Mark Tanner and Neil Anderson which originally appeared in the ELT-EJ in 2009. The authors describe a web-based system of helping learners find the materials they need in the self-access centre at their institution in the USA. The new web-based system was introduced to learners during the initial orientation, and results of a study indicate that this had a positive effect on self-access centre use. The current issue also features three shorter articles from Japan; two “work in progress” pieces and one “summary” article. Troy Rubesch shares some insights related to a self-access website that operates alongside the physical centre at his institution. The numbers of people visiting the website has increased dramatically in recent months, and Troy briefly describes some of the main features which have attracted student interest. Kevin Knight outlines a project proposal which involves the design of a self-study module for learners focussing on business English. The module draws on principles of outcomes-based education (OBE) and links career paths with English for Specific Purposes (ESP). Simon Cooke provides a summary of some work on a materials development project at his institution related to using song lyrics. One of the aims of the project is to “make sure the texts and tasks are as interesting, relevant and enjoyable as possible so as to exert a positive influence on the learners’ attitudes to the language and to the process of learning it” (Tomlinson, 2010, p. 90). Simon discusses the process of developing suitable worksheets to accompany songs for students working in a self-access centre in his context. Finally, the current issue contains two contributions in the “reviews and resources” section. Ene Peterson takes a look at some of the benefits of using web-based listening resources for independent language study. Ene provides a very helpful selection of resource websites along with some suggestions for how they can be used. She even provides examples of worksheets accompanying some online listening texts that can be used by learners working independently. Anna Taylor (Gorevanova) shares her views on a website called Open Culture that is used at the British Council self-access centre in Uzbekistan. Anna discusses some of the many features of the website along with some of its strengths and weaknesses. Tomlinson, B. (2010). Principles of effective materials development. In N. Harwood (Ed. ), English language teaching materials: Theory and practice (pp. 81-108). Cambridge: Cambridge University Press. Many thanks to the contributors for choosing to submit their work to SiSAL Journal, to the reviewers who gave useful and timely feedback and to the editorial team for working hard to get the issue ready on time.